The first large-scale sheep farming venture on Stewart Island was commenced in 1874 on what proved to be unsuitable terrain at Scott Burn. Within a few years other sheep runs were taken up on drier land at Island Hill and Kilbride in Masons Bay on the western coast. Prior to this only small numbers of sheep had been kept on the island for household supply, mostly at The Neck (on the east coast). Sheep farming was never greatly successful on the island, although it did continue until the 1990s. Sheep that escaped from farming operations formed a feral population and some have been recovered in recent years and maintained on the mainland. These are described as being very like those from Arapawa Island in size (i.e. 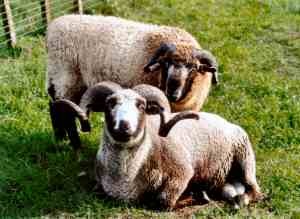 relatively small) and general appearance – the rams having particularly fine horns. They are mostly black and often have a patch of white on the nose and between the eyes, and a white tip on the tail. In behaviour they are very alert and aware of what is going on around them. In a group, a female will often act as a ‘lookout’ for the approach of strangers. The ewes are very protective of their lambs. They don’t need drenching and don’t get daggy. On lean feed they tend to hold their condition better than commercial breeds. Since the cessation of farming, the Department of Conservation has taken steps to eradicate feral sheep (and other feral animals) from Stewart Island to prevent them damaging native forest and the habitat of native wildlife. Thanks to Ron and Kath Gallagher for a description of their Stewart Island sheep.